Cataracts are a common type of vision loss with more than 22 million people in 2017 afflicted and over 30 million by 2020. They typically strike people over age 40 and are the leading cause of blindness around the world. A cataract is the stiffening of our eye's natural lense, which leads to blurry vision and clouding. While they are painless, they cause poor night vision, distracting glares, and reduce color perception. Similar to glaucoma, cataracts are known to develop slowly. They may or may not need surgical treatment. However, if treatment is necessary, the board-certified eye surgeons at Vold Vision in Northwest Arkansas are skilled to treat them. Dr. Vold is a world-leading cataract specialist and offers a number of cataract treatments. Fortunately, the vast number people who have cataract surgery regain vision between 20/20 and 20/40. Vold Vision offers some of the most advanced technologies to diagnose, stage, and treat cataracts. Worldwide cataract cases easily outnumber most all other common eye conditions. The eye surgeons at Vold Vision treat every type of cataract. Types of cataracts include a subcapsular cataract, which is localized on the back of the lens. Those with diabetes or taking heavy steroidal meds run a higher risk of developing a subcapsular cataract. Another type of cataract is a nuclear cataract, which forms deep in the middle of the lens. Finally, a cortical cataract has white, spoke-like wedges on the lens periphery. This cataract is located in the lens cortex, the area surrounding the nucleus. Each form of cataract requires a unique treatment plan and ongoing management. "I went to Vold Vision last summer to have cataracts removed in both eyes. I was very impressed with all the staff and level of professionalism and especially Dr Vold. I highly recommended them!" "Highly recommend - The Vold Vision team is amazing. I had cataract surgery with the multifocal premium lenses. It is like a miracle. I can see up close and in the distance. No more glasses. Dr. Vold, Dr. Frankel, Dr. McFarland, the surgical nurses, the surgical staff, the office staff, the accounting staff as well as Jessica and Grant who hosted the luncheon with a doctor have all shown a commitment to doing business right and treating patients professionally. I highly recommend them." "Saved my mom's eyesite!!! She would have loss her eyesite in one eye after cataract surgery by a previous doctor. Dr. Vold has state of the art technology! I now go to Vold Vision also." "Every one was kind and helpful they were able to get medicare to pay almost all of it and then allowed me to pay the balance monthly .. i havent been able to see out of my right eye for a year due to a catarax the size of texas... lol.. its been 4 days.. and im typing this on my phone using only my right eye... dr void rocks... thank you for my sight back.."
"Five Stars - Great Experience, the process was quick, easy, painless, and the results where GREAT! I now have 20 20 vision and only need to use readers! I also, had the procedure to address Glaucoma and now that has reduced the eye pressure by half! The Staff is professional, caring, and knowledgeable! Linda"
In the early stages, cataracts begin very small and are almost undetectable. However, given time, vision will start to blur more and more until the effect can be comparable to looking through a cloudy piece of glass. A cataract may make sunlight or lamplight seem unnaturally glaring. This can be noticeable especially when driving at night and observing oncoming headlights. Colors may also start looking washed out. The signs and symptoms can vary widely depending on what type of cataract you have. For example, a nuclear cataract may at first improve near-field vision and is called “second sight” while a subcapsular cataract may not have any symptoms until it is more developed. As proteins clump together and cloud the lens, you can experience a whole spectrum of symptoms, which alerts you that your vision is no longer optimal. Regardless of symptomology, the moment a cataract is suspected, it is important to see a trained eye doctor for a correct diagnosis. Early symptoms may be treated and relieved for a while with stronger glasses and magnification. However, as symptoms persist to the point of becoming debilitating, it may be time to consider surgical solutions. Cataract surgery with Dr. Vold is a relatively painless procedure as you begin a journey to reclaim your vision. Cataract surgery is extremely successful in restoring vision. It is the most frequently performed surgery in the country with more than 3 million completed each year. At Vold Vision, these surgeries are led by the award-winning Dr. Vold, who specializes in the diagnosis and management of cataracts. Relying on him and his team of eye specialists is important for ensuring the most effective cataract treatment possible. 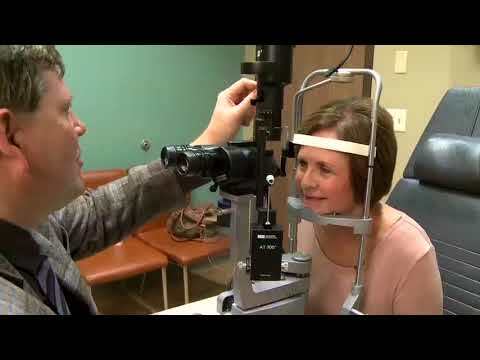 Patients with cataracts face a stressful situation and they rely on Dr. Vold, an international leader in cataract treatment, for the constant guidance and assurance that their condition is being closely monitored. Dr. Vold and his team tend to patients with a continuum of care that ensures success from diagnosis to surgery and beyond. We invite you to reclaim your vision and call our central Arkansas locations now to take control of your cataracts at Vold Vision.